I have always appreciated the writings of Guy Gavriel Kay for a number of reasons – I appreciate the fact that he is a Canadian writer who has become an internationally-recognized artist (his works have been translated into more than 20 languages and he has won multiple international writing awards). I also enjoy his books because they are truly what I’d call literature – his novels are deep and rich and complex. 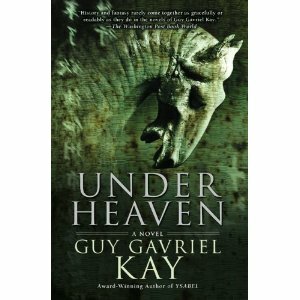 For those reasons I was interested in reading Under Heaven because I wanted to read Kay’s most recent work. I wasn’t disappointed. Set in China during the 8th century Tang Dynasty period, Under Heaven weaves together elements of historical fiction with fantasy. There are tonnes of images, symbols and themes that bring out the “literary” reader in me as I strive to wrap my mind around Kay’s writing on both the literal and the literary planes. I enjoyed the fact that I could read this novel in two ways – it can be read simply on its face because it contains great description, an interesting plot that moves at a reasonable pace and also includes interesting and engaging characters. I also appreciated that I could, however, dig more deeply into the novel and read it for its deeper meanings. I must admit that I haven’t read a novel of this caliber for some time, so it took me awhile to get into it and truly engage myself in the process. Once I did, however, there was no turning back. For those who enjoy Kay, I would highly recommend it. I’d also recommend it to anyone who enjoys reading either historical fiction or fantasy because it will not disappoint! I received an advance reader copy (slightly different than the final product usually) and this is my book of the year so far. I was so into the characters’ lives that I sometimes couldn’t put it down. That hasn’t happened to me with a book for years. I also found that I didn’t need to know much of the historical background to really enjoy it as a nove. Oops. Last word was novel. I must say I really like the way your new blog looks. I need to take the time to learn more and update my blog.